A fun Fireworks Kids Craft Project that is simple & easy for kids to help celebrate Memorial Day or the 4th of July! This is a super simple and fast craft that’s great for a wide range of ages. Your little ones will enjoy helping squeeze the glue out (great fine motor skills practice!) and your older kids ail enjoy making more intricate firework designs. Simply start by drawing “fireworks” onto the construction paper (we chose black paper to represent the night sky) with your glue. My artist chose to make a lot of stars and asterisk symbols (his representation of fireworks) but you can get as creative as you would like here. Next, shake your glitter onto the wet glue. Once your glue is covered, shake off any excess or use the excess to cover any parts left uncovered. Repeat the process to fill up your “night sky.” Let the paper dry flat and then enjoy your sparkly work of art! 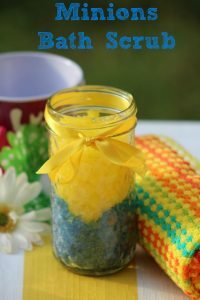 I love kids craft projects like this, because they allow kids to be as creative as they want to be, and only requires a few materials to complete! They can choose from any color of paper or glitter that you have on hand, and can draw any shape their imagination can conjore up! Do you know a child that would love to make this Fireworks Kids Craft Project? Share with us in the comments, we love to hear from you! Like this craft idea? Be sure to PIN IT and Follow me on Pinterest! Subscribe via Email, RSS Feed, or Follow me on Bloglovin so you don’t miss out on any fun craft projects that you can do with the children in your life! This will be a fun project to do with my little nieces and nephews when they come to visit. Thanks for sharing. This is so cool. I have a granddaughter born on the 4th of July, so when she gets a little older I think we will make these. What a fun craft. My nieces would love this. They love all types of arts and crafts. What a fun and easy project! So cute too. I think my daughter would really enjoy this project. Thanks for sharing! This is a really great crafting idea that sparks creativity and imagination. My nieces love seasonal crafts and would enjoy making the fireworks pictures. One things kids love – GLITTER! This is a very cute 4th of July project for the kids thanks for sharing your crafts with us. This is a really cute craft. Would be great for the grandkids when we go to the beach this summer and have a rainy day. Thank you! My grandson would love this project. Glitter and glue are two of his favorite things! This is really fun! My daughter loves glitter and fireworks, so this project may have to happen soon! My kids are older and would probably still enjoy this! I wonder if I could modify the idea somehow to make t-shirts for the 4th of July? Very cute and creative! I miss my kids making interesting art pictures with glitter! Such a fun and easy project, I know my grandsons will have fun making this. Thanks for the post. This would be a perfect project/craft for the kids to work on our 4th of July party! I think this is a cool project! My daughter is too little yet but my sister is four years old and I have a feeling she would LOVE to make glittery fireworks this summer. I’ll have to do this with her. Thanks for the idea! Very fun craft to make sparkly fireworks. This is unique – the grand kids would love it! this sounds like a really great kids project. thanks for sharing! This looks like fun. Great for the kids. This is really cool – I love it and it sure looks so much fun to make! I really love this nice and safe project. This is a great alternative rather than very dangerous fireworks. This project would be great for me to do with my great grandchildren. They would really enjoy this!! This is such a cute and clever project, and I already have everything that I need! These would be great for hanging up for our annual 4th of July BBQ, and we can even set out a station for guests to make their own! This looks like a fun and creative project. Thanks. Wish my kids were a little younger! This is very creative and pretty too. I used to love glue crafts when I was a kid. Interesting project for kids to participate in but worthwhile. This would e super fun for my girls 6 and 8 to do. They get out of school for summer on June 3, and I could have this craft ready when they say I’m bored!